First of all, I'm pretty sick, so I sound like Death Warmed Over. Lovely, yes I know. And THEN, the inevitable happened. I started the video, and had adjusted my audio recorder sound and all that good stuff, and I started chatting away, and nearly 15 minutes later when I stopped the video, do you want to know what I discovered, dear blog follower? Yep, I had forgotten to hit the start button on the audio recorder. By that juncture, my voice was *worse* if that's even POSSIBLE from talking so much, and the spirit of re-recording was just not in me. So I had to grab the audio from the video, and in the process, the audio isn't fantastic, I'll tell you that. You'll have to turn your volume up a bit this week. Plus, you can hear a few notification sounds that came up on my machine while I was finagling this, so, SO sorry. A learning experience, I'll only get better from here, I promise!! OK, so this week I discuss this new podcasting enterprise (instructions for subscribing are below) and also the state of my New Year's resolutions. How are yours going, dear reader? 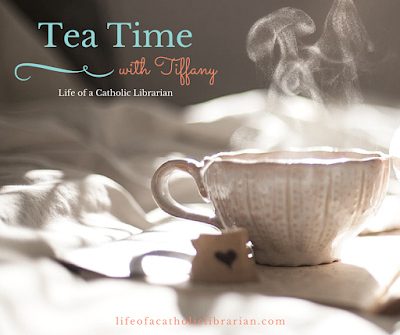 These new podcast episodes of Tea Time will be about 10-15 minutes each week. I'm allowing myself to be a bit chattier since you have an audio only option now. :-) To subscribe to the audio version of Tea Time with Tiffany, just search for it in iTunes or use this link to subscribe on Feedburner to your podcatcher of choice. Sacred Reading for the daily Gospel readings and additional short reflections. How are your New Year's resolutions going? Oh! I mentioned maybe signing up for a new fitness class for one lunchtime a week at work. Do you have one that you go to and like? Zumba? Pilates? Yoga? Give me all the deets, I'd love to hear them! 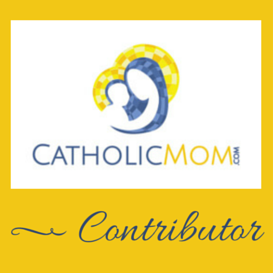 This is completely off topic but I noticed in the sidebar that your blog patron for 2016 is St. Raymond Nonnatus. I have to ask do you watch Call the Midwife? That is the first think I thought of when I saw his name. I then went and read his story and wow he suffered quite a bit for the faith. Hi Melanie! Yep, I have, in fact that's the first thing I thought of too when his name came up! We enjoyed the show on the whole. Tiff, this is so exciting -- you're on my phone, in my podcast app! So cool! I haven't made much progress on my Jesse Tree treasure hunt, but the idea has blossomed into devoting the whole year into making Christmas 2016 really special. I've had a bunch of crafty things that I've always wanted to do, and just never got around to it. I've started with a Nativity Scene and designed my first pattern ever! So chuffed. Hope you get better soon, horrid to be so sick, particularly when there's teaching coming up. Nance, *squeal*! I know, right? !